With Prodependence, Dr. Robert Weiss offers us the first fully new paradigm in over 35 years for helping those who love and care for addicts. An attachment-focused model, prodependence recognizes that no one can ever love too much, nor should anyone be pathologized for whomever they choose to love as is often the case. Prodependence informs caregivers how to love more effectively, but without having to bear a negative label for the valuable support they give. When treating loved ones of addicts and other troubled people using prodependence, we need not find something "wrong" with them. Instead, we acknowledge the trauma and inherent dysfunction that occurs when living in relationship with someone whose life is failing and keep moving forward. Validating a caregiver's painful journey for what it is opens the door to support them in useful, non-shaming ways. For full emotional communication, one person needs to allow his mind to be influenced by that of the other. If my beloved wife of twelve years received a cancer diagnosis and we had two kids under the age of seven, would anyone label or judge me for doing everything possible—even to the point of giving up important parts of my life—to keep my family stable and relatively happy? If I took on two jobs, quit my exercise program, resigned from the company softball team, and stopped seeing friends to address this unexpected family crisis, would anyone in my life call me out as enmeshed or enabling? And if I went to a therapist for support, would my therapist ask me to explore the ways in which my dysfunctional childhood might be pushing me into an 'unhealthy obsession' with my wife's cancer diagnosis? To push this example a bit further, what if my wife refused to accept the traditional medical route to healing, deciding instead to rely on unproven herbal treatments? In that situation, should I support my wife's attempts to heal 'her own way' even if I disagree? Should I spend every waking moment trying to convince her to trust Western medicine? Should I try to slip prescribed but unwanted medications into her tea when she's not looking? And if I did any or all those things, would the people in my life think of me as overreactive? Would they think that my family commitment was a negative manifestation of my traumatic past? Or would they have empathy and compassion for my grief, my fear, and my unshakable commitment to someone I love? To be honest, I have no idea how I would act under those circumstances. I might make the right decisions. I might make the wrong decisions. Either way, I know that I would be doing the very best I could to help my spouse heal and to care for my children. And I wouldn't let anyone—friends, family, my employer, a member of the clergy, my therapist, or anyone else—tell me that my attempts to help were borne out of anything but healthy love and attachment. Of course, nobody in my world would try to tell me otherwise. Instead, friends and family would show up on my doorstep with flowers, home-cooked meals, and sincere offers to help with childcare, shopping, yard work, and housecleaning. Meanwhile, my therapist, clergy, and employer would understand and accept that my family is in crisis, that I love them, and that I must give of myself in an extraordinary way, even if that looks a little obsessed or makes me seem a bit nutty at times. And if any of these supportive individuals felt that I was overdoing my attempts at caregiving, possibly to my own or my family's detriment, they would not chastise me. Instead, they would nudge me toward caring for myself as well as my family while offering gentle advice about how I might care for my loved ones more effectively. They wouldn't stand back and judge me; they would lean in to help. In my world, people who take time out of their own lives to help an ailing or physically disabled loved one are called saints. They are amazing, wonderful, and special. In contrast to the story above, let's say my spouse of twelve years became addicted to alcohol and prescription painkillers. Let's say she lost her job because she was drunk and high at work. Let's say that because of her addiction, I can no longer trust her to adequately care for our kids. What happens now when I take that second job, stop going to the gym, stop hanging out with friends, eliminate my recreational activities, and start to obsess about her drinking and using, all while paying the family bills and caring for our children? Will my friends and family, my employer, my clergy, and my therapist support this degree of caregiving and caretaking while empathizing with my frustration and exhaustion? In the addiction world, support and therapy for the loving spouse or parent of an addict typically involves judgmental head-shaking, tut-tuts, and expressions of concern about the caretaker's problem, with that problem being identified as dysfunctional attempts to love, save, rescue, and heal the addict and the family. Addiction is a universe where caregiving is often viewed as enmeshed, enabling, and controlling, and choosing to stick with an addicted loved one is seen more as a reflection of the caregiver's troubled past—meaning unresolved early-life trauma and abandonment issues—than an indication of love and healthy bonding. ©2018 Robert Weiss. All rights reserved. 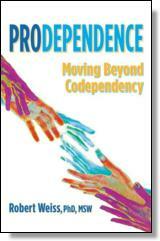 Reprinted from Prodependence: Moving Beyond Codependency. No part of this publication may be reproduced, stored in a retrieval system or transmitted in any form or by any means, without the written permission of the publisher. Publisher: Health Communications, Inc., 3201 SW 15th Street, Deerfield Beach, FL 33442.